Shade Tree mechanic; love motorcycles too. Tennessee native. Wow!!! I can't wait!! Thanks so much Don!!! Found a way to get rid of that poorly done "WE" in the pin striping script.....Killer D meant it to say "Just wanta have fun". 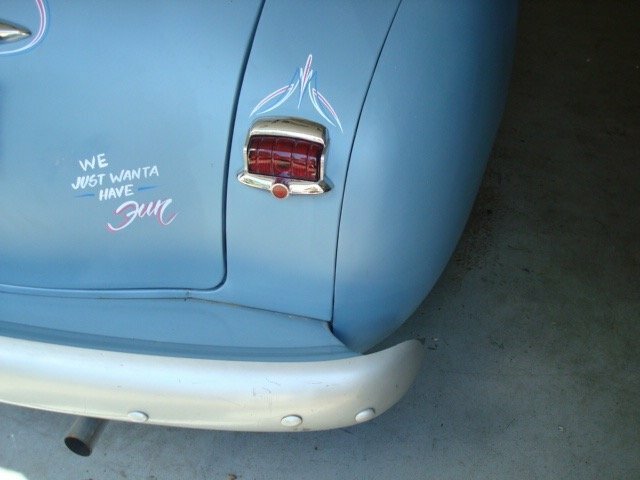 Went to a body shop and they advised that matching the paint was pretty near impossible, so no painting over the "WE". I had a ROUTE 66 fridge magnet, and I just hid the "WE" with it. I think it looks super! Does Murfreesboro have a bad reputation or something? And Don - notice that the "WE" in the "WE JUST WANTA HAVE FUN" script was added by the guy I bought it from and is poorly done. I am going to have that removed. Don - I found the car not too far from where I live in Murfreesboro, in a little town called Rover. I do not know who had it before the guy I bought it from. The pin stripe work was done by Killer Designs by Darin Allen. He is a noted pin-striper; he has won the Easyrider's Builders Class Show and Sturgis Rat's Hole award, done striping for F1 cars for Gene Simmons of Kiss, and Gene Wilder, to name just a few. He did sign his work - if you look closely at the photo with the intricate pattern you can see a very small "Killer d" just above the dark blue loop at the bottom of the photo. Thanks Andy - I notice some big differences between our sunscreens. Yours is much fancier; it has a raised center section (I'm guessing for adjustment, and it is two pieces) and it comes to a peak in the center, while mine is one continuous piece, with no peak. My center support bracket is one piece of metal with no screws at all. So my screen is not adjustable at all, which tells me it was made to fit a 40 to 48 Plymouth. Could it be a factory screen? One thing for sure - it is a quite simple design...one single piece of metal, formed in a gentle sweep, rimmed in stainless. Maybe someone else on the Forum has some answers??? By the way - that is a super nice center support bracket you fabbed!! Regards from USA......Blue. I saw a previous post about a Fulton sun shield. I have no idea who manufactured the one on my car. I cannot find a label anywhere. Is it a Fulton? Or something else? Thanks! Photos are attached. Blue. Thanks Joe! With your help I feel like I understand how these things work. Everyone talks about how simple these cars are, but this gauge, to me, ain't that simple!!! Uh - oh...Put some power to the unit, with the sensor leads attached, and the heating coils stayed stone cold. New gauge required. Oh well, I learned one more thing about my 48. That is valuable to me. Thanks again, Joe Lee. Wow! Thanks Soth! I will pull her out and clean the points and spray her down. I agree - the diagram shows the needle in free float - that makes me breathe a sign of relief. With the diagram I can check everything out. Thanks so much! Murfreesboro, 22 miles southeast of Nashville. I would love to have one of those old license plates. I still remember when the first number of the plates designated the county with the largest population. Those plates were from Memphis. 2 was Nashville. 3 was Knoxville. 4 was Chattanooga.